Seven new polls today, one of them quite interesting. Survey USA ran a poll in Michigan completed Aug. 3 and it shows Kerry with an 11% lead there, well outside the 4% MoE. On Wednesday we reported a Survey USA poll giving Kerry at 12% lead in Pennsylvania. So now we have two of the big industrial battleground states, worth a total of 38 votes in the electoral college, in dark blue for the first time. Not a happy day for Karl Rove. However, Karl can take comfort from the fact that Bush is maintaining his 5% lead in Ohio according to a new Strategic Vision poll. Ohio is a must-win state for Bush and right now he doing well there. Also, Kerry's lead in Minnesota has dropped from 8% to 2%, with Nader at 3%. Iowa is still a statistical tie. Florida has also flipped back to Bush, but only by 1% so it is still a statistical tie there, too. 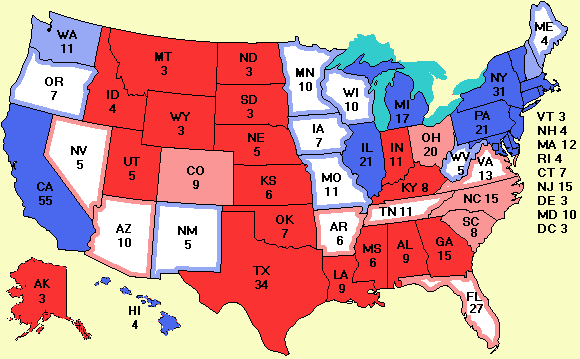 Today's map is illustrative of what could actually happen in November. Bush wins Ohio by a substantial margin, wins Florida by a handful of votes, yet loses the electoral college due to Kerry's growing strength in the industrial states of the Midwest where many people have lost their jobs. But November is still a long time away. Rasmussen just came out with two more of its 31-day tracking polls. In Arkansas Bush and Kerry are tied at 46% each and New Mexico gives Kerry the lead by 50% to 43%, but these polls are older than polls we already had so they don't count under our "latest-poll-wins" rule. Someone alerted me to an excellent website about electronic voting. It is maintained by Ronald L. Rivest, a professor at M.I.T. and one of the world's foremost authorities on computer security. It has dozens of links to articles, some of them are technical (what is actually wrong with the voting machines and how they could be manipulated), but many of them are popular articles for laymen and politicians, editorials, etc. If these machines fail (or are hacked) in November, as they have been many times in the past, they are going to be to 2004 as the pregnant chads were to 2000, except that recounts are not possible with them because there is no paper trail. California has banned some of the worst ones, but Ohio and other states are still planning to use them. You would think that a country that can send men to the moon could at least build a voting machine that worked.